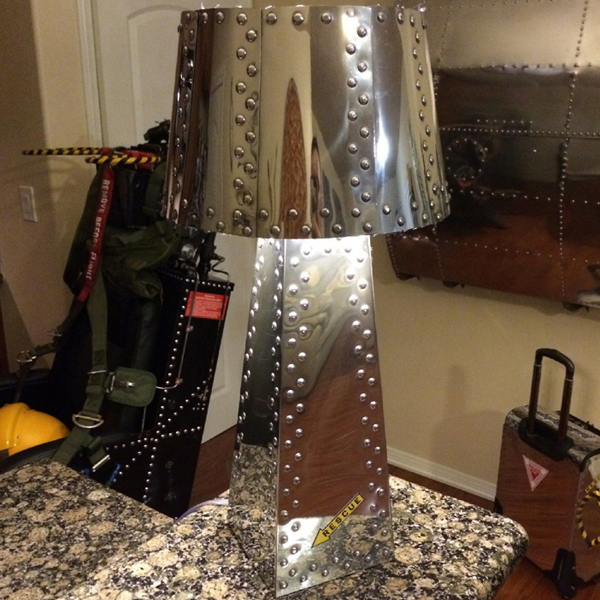 Here’s a polished aluminum DESK LAMP that I fabricated from scratch out of .032 aircraft aluminum and 5/32″ solid aluminum rivets, ready for your office of living room. It’s styled after the World War Two Bomber’s that left the factories in a polished aluminum finish. If you purchase this one, it’s serial number 001. If that’s already sold, please allow up to 4 days for me to made one for you, and you can have it customized, like with a protected switch as used on aircraft of that era, more or less rivets, I’m happy to make it the way you want it. Comes with a 13 watt Compact Fluorescent in 2700 degree Kelvin color, bulb but I think a more ‘yellow’ bulb would give it more character. Free shipping in the Continental USA. A perfect gift for a Pilot, War Veteran, or anyone who has respect for ‘The Greatest Generation’. I’m also open to suggestions for other products that I can custom make for you. If it’s made from aluminum, I’m happy to make something special and one of a kind for you!